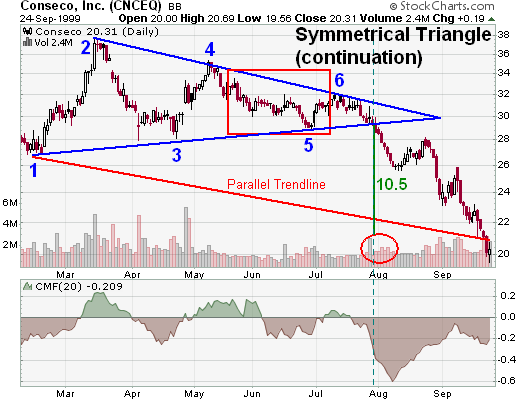 In the picture above, we can see what appears to be a symmetrical triangle pattern formation. The first characteristic worth noting on this chart, however, is the fact that the price is currently adhering to the bottom line. This is usually a sign of heavy bear pressure. 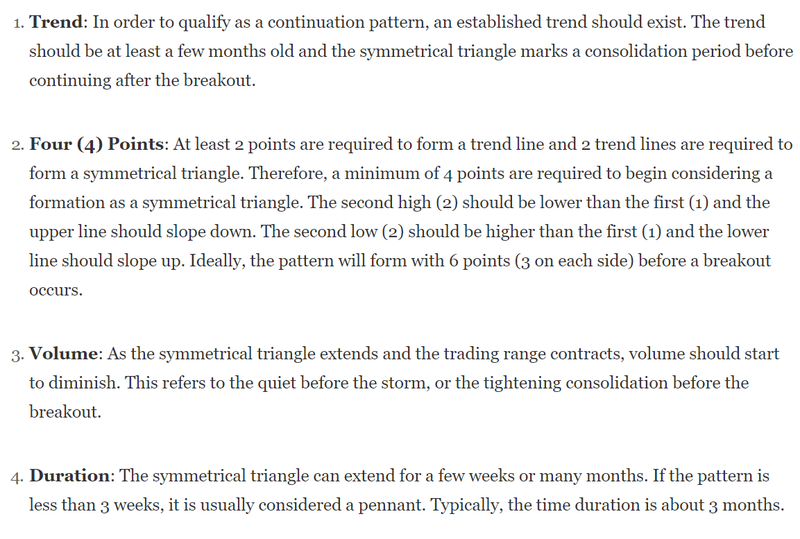 This bearish adherence to the bottom side of the symmetrical triangle is shown in the chart above. However, it is not enough to merely look at these charts, we must note the dramatic difference in slope of these two lines. One often overlooked facet of the symmetrical pattern is the fact that the slopes of the lines usually should be roughly equal. In this case, they are not. In fact, the slope of the upper downtrend resistance line is substantially steeper than the slope of the underlying support trendline. 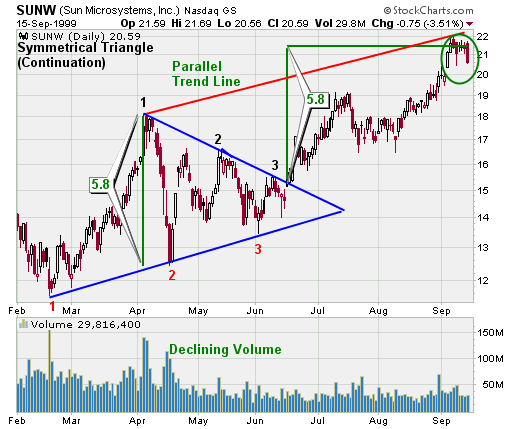 In the picture above, we can see that the downtrend resistance is hanging at 30 degrees. However, the uptrend support is currently only calculated at 4 degrees according to this chart. Because of the fluctuations on the TradingView charts, the mode was switched to lock price ratio, in order to get a fixed calculation for both angles. From this very aspect alone, the future for Bitcoin, pricewise, looks extremely bleak for bulls. As mentioned above, the greater the angle of the trendline, the the stronger the support/resistance. 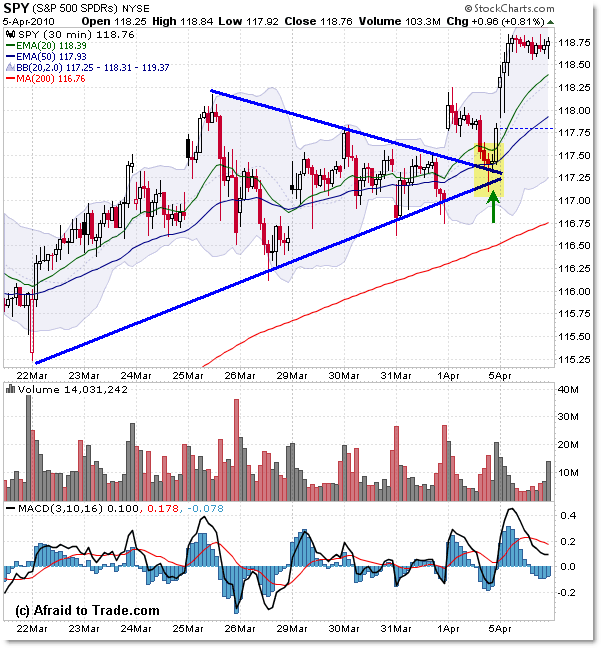 Conversely, the smaller the angle of the trendline, the weaker the support/resistance. 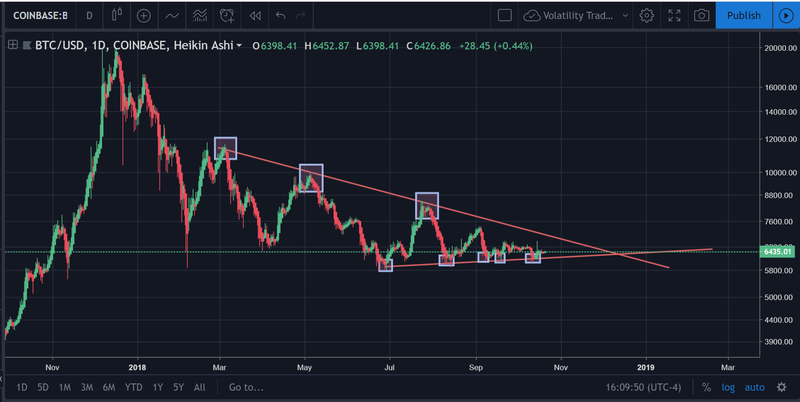 In fact, given the weakness of the lower trendline, it would be wholly inaccurate to consider the pattern on Bitcoin currently to be in a symmetrical triangle. The upper trendline has also resulted in the stoppage of multiple noteworthy ‘bull run’ attempts. In the chart above, we can see that the price of Bitcoin has been stifled multiple times. Perhaps one of the most reliable support/resistance systems in all of trading is the Fibonacci indicator. 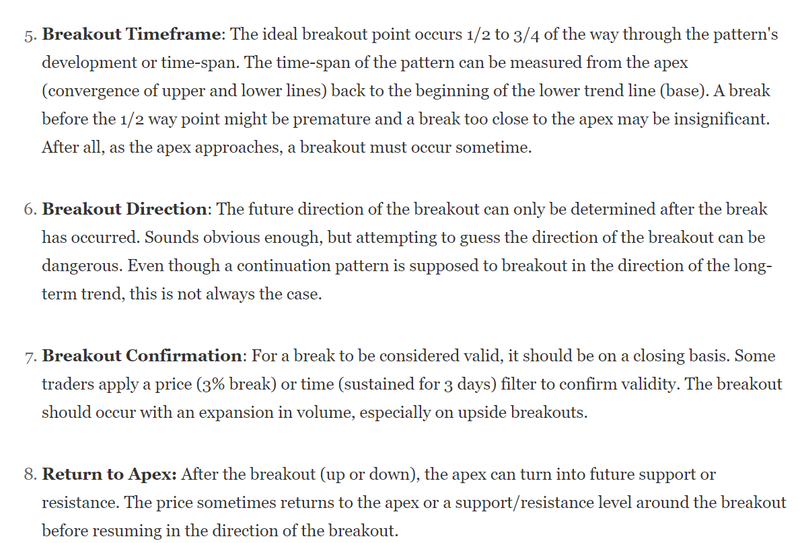 This indicator typically makes assessments of the price that are difficult to deny. Let’s start with the Fibonacci Wedge, shall we? You make sure that the ‘starting point’ of the wedge is at the peak, or the price’s all-time high. Then you extend the chart going out toward the starting point of the price movement. In this instance, we chose August 2015 as our starting point. You must then extend the remainder of the circle to the right of the all-time high (in the future) the same distance. The distance between September 2015 and December 2017 (ATH for Bitcoin) = 2 years and 3 months. Thus, we must extend the circle 2 years and 3 months into the future. That puts us at March 2020. In the picture above, we can see that the price is literally nudging against that 61.8% retracement point. A further breakdown would put it in the 78.6% retracement zone. As one can see in the picture above, the worst case scenario for Bitcoin would probably be crashing down to $2.5k (assuming that the 78.6% Fib retracement holds). We do not anticipate that happening and one reason why is due to the fib speed resistance angles on Bitcoin. In a nutshell, the Fib Speed Resistance dictates the speed at which Bitcoin is decreasing. You draw these resistance levels by tracing the price from the all-time high to the subsequent lowest price and the rest of the indicator graphs itself it from there. 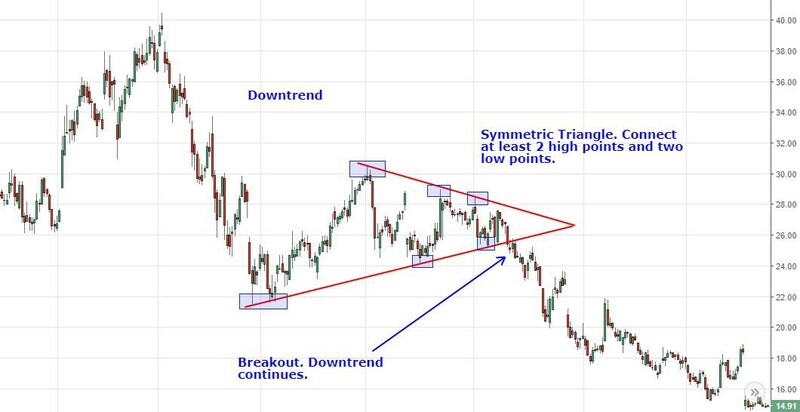 In the price above, we assume that the price will continue to adhere to the long-term downtrend resistance that is currently imposed upon the price at this very moment. That would bring the target price all the way down to $4.5k as the official (bottom). Which, all things considered, is not a bad landing spot for bulls, as it is certainly much less of a drop than what Bitcoin has already experienced and it is certainly much less of a drop than what Bitcoin has experienced even in 2018 between localized highs and bottoms. In the chart above, we can also see that the maximum upside for Bitcoin is more than likely $6.8k. 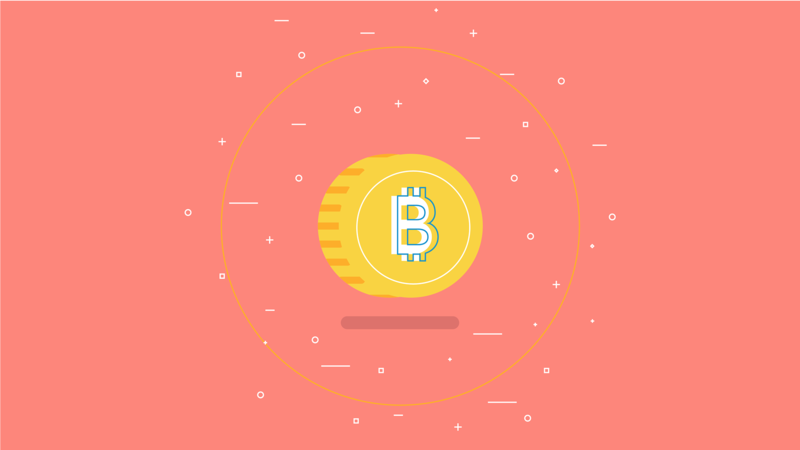 There are substantially more points that are worthy of note than what is seen in this article, but this overview generally sums up what can be gleaned about the price of Bitcoin in the very near future.